Marcasites glisten like early morning dew on leaf earrings from Thailand's Wadarat Supasirisuk. Captivating, the sterling silver earrings feature an oxidized finish for a vintage look. 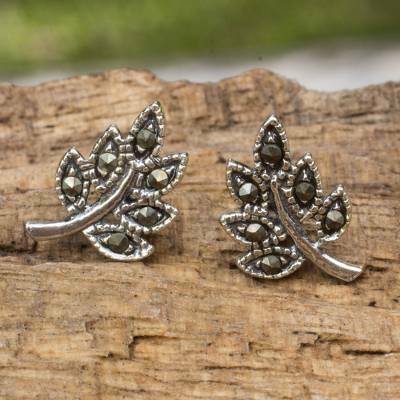 You can find sterling silver and marcasite stud earrings 'Petite Leaves' by Wadarat Supasirisuk in jewelry categories such as Leaf and Tree Earrings, Marcasite Earrings, Silver Earrings, Sterling Silver Earrings and Stud Earrings. Enjoy exploring these sections for other Novica treasures. The picture doesn't do these justice --- they are gorgeous! I have received several compliments on them. Beautiful! Perfect size Thank You So Much. "These are delicate but have personality "
These are really beautiful -- and so unusual too. I like wearing them alone as they are so much nicer then just plain small gold hoops or good studs. I also use them to hang other earring]s on the post at the back -- makes those other earrings look so much smarter and unusual.